Metaphors are one of the most important sources of knowledge and understanding. Moreso, it is a metaphor that really wins the battle of ideas, not a proof. If you have doubt, think of the 'invisible hand' or a 'black swan'. However, metaphors can be taken too far or misinterpreted. A colleague recently forwarded on a great one, which certainly has promise, but also some danger. And it relates to risk. The metaphor I speak of comes from a story released by a Bloomberg columnist Mark Buchanan. The story is called 'Economists Have a Lot to Learn From the Weather' and it outlines a view of the world that directly contradicts the neoclassical (economic) one and thus most of what is today called risk modeling. He writes: "Almost five years after a financial crash nearly thrust the world into depression, a peculiar paradigm still dominates economic thought. Known as the neoclassical school, it aims to give Adam Smith’s notion of the invisible hand its mathematical form. It asserts that markets naturally seek an equilibrium that harnesses individual self interest to allocate investment capital in an optimal way. Even if that perfectly efficient ideal is never reached, the logic goes, markets work better insofar as they approach it. Anyone who thinks our recent financial travails would have discredited this vision is underestimating the mental inertia of theoretical economics (and risk modeling - d.s.). To this day, the Federal Reserve and the European Central Bank go right on making plans using so-called general equilibrium models of the economy. In these models, financial firms don’t exist, asset bubbles are inconceivable and there’s no such thing as an international market in derivatives." The author then contrasts the approach of the modern portfolio theory with the one taken by the atmospheric flow researchers. After all, aren't storms and hurricanes the best metaphors for market crashes? I have been through both financial crashes and some storms and must admit the uncanny similarity in the experiences. Mr. Buchanan points out that: "The weather is a tough problem, because nothing in it can be reduced to a state of balance or equilibrium (as a simple atomic nucleus can). Therein lies the key insight for atmospheric flow. Storms and weather fronts aren’t accidental and unimportant “details” of the atmospheric flow at all. They are central to the way the Sun’s energy, once absorbed on Earth, flows about the planet. The jet streams that race around the planet at high altitude can’t remain stable... Ultimately, this phenomenon, arising from something called baroclinic instability, creates large swirling vortices of air that drift through the middle latitudes, transporting huge quantities of heat and water all over the planet, and causing our unpredictable weather.No mathematician can “solve” the complex equations for air in the atmosphere." "These un-forecast-able systems are much, much less complex to forecast than economic systems, because, as you say, the social aspect, which introduces strategic, adaptive behavior with feedback, is central. Grains of sand or rice don't adapt." In this regard, I think that studies of people with free will, like the Information Cascades (see Extrema post here) research, when applied to financial markets, provide great insight. Modern Portfolio Theory risk management can only work in an equilibrium seeking financial system, because it allows for extrapolation of recent observations into the future as risk forecasts. It is quite easy to see how economists got enamored with the idea of equilibrium - it is just so elegant. But despite the fact that it was shown time and again that this equilibrium-seeking is a myth, the economists still cling to it and so do present day risk models. When it is not flatly denied (Milton Friedman, Eugene Fama or Peter Bernstein) the problem is simply ignored (no substantive changes in risk modeling approaches) or drowned in mathematical gymnastics. In the next post, we will offer a few other metaphors which give us a useful way of looking at risk, modeling and managing it. And we will see why social aspect complicates things in the Modern Portfolio Theory framework, but can actually simplify things in a more realistic paradigm. 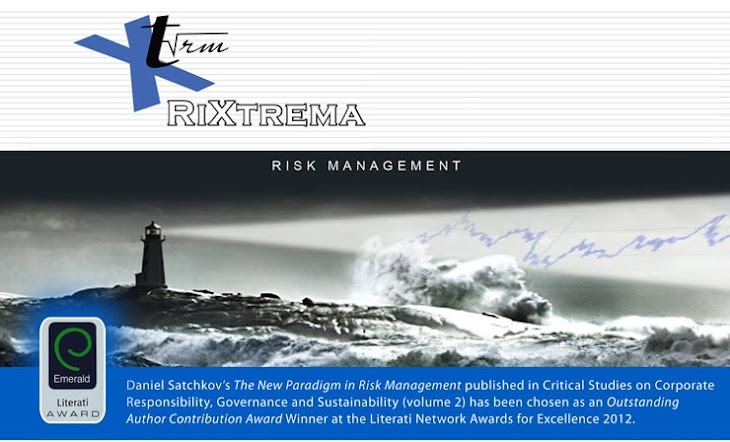 Our blog is dedicated to the discussion of extreme events in the financial markets and all the issues related to the topic.